Over 500 Eye Camps held in various villages in India where minor operations and timely care helped thousands of people improve their sights. 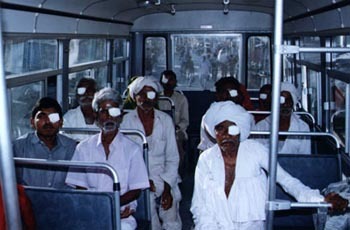 Five Eye Care Centers formed in India at Mithapur, Zagadia (Gujarat), Mandoli in Rajastan and in West Bengal. Over 75 containers of Clothing sent to India and Africa. Grants given to Blind students for study. £ 80,000 was donated for various causes during the 1988 famine in India. Three medical centers are run in Mumbai at Goregaon, Tawacan and Mira road with assistance provided by AFH. To date, over 25 mobile vans and ambulances have been donated for use by various organizations to assist patients. A Free medical center is run in association with Shri Ramanand Shastri Charitable Trust. A village, Devkundipada, Maharastra has been adopted for development. Funding provided regularly for Vradhashram, Bal Ashram, Eye Hospital, and Medical Center at Lonavala. One TB Van (Ambulance) given to Arya Medical Relief Mission for to assist patients. £ 20,000 collected recently for the Orissa Cyclone Relief Fund for ongoing projects in Orissa and the monies shall be distributed for various projects in hand.